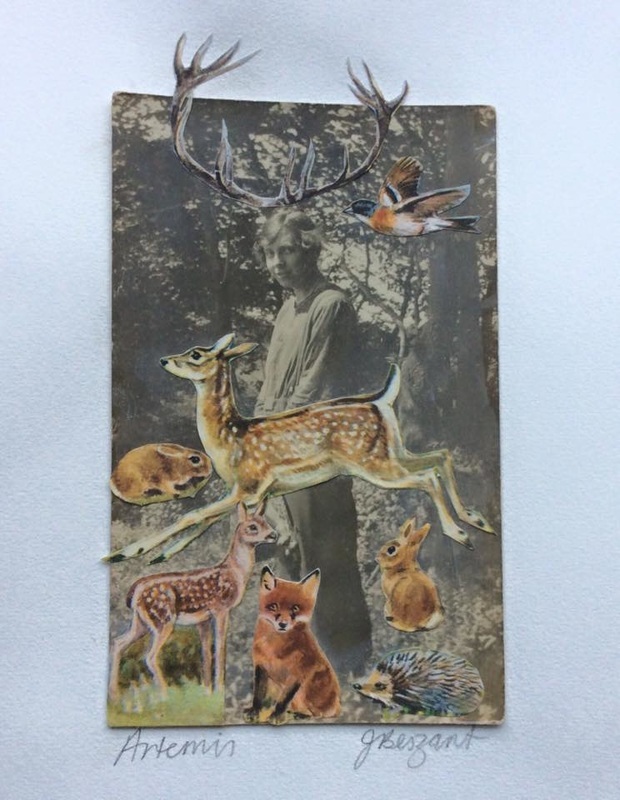 So long missing from here - work is ongoing and currently a selection is up at Masham Gallery as part of the Cut and Paste collage exhibition. 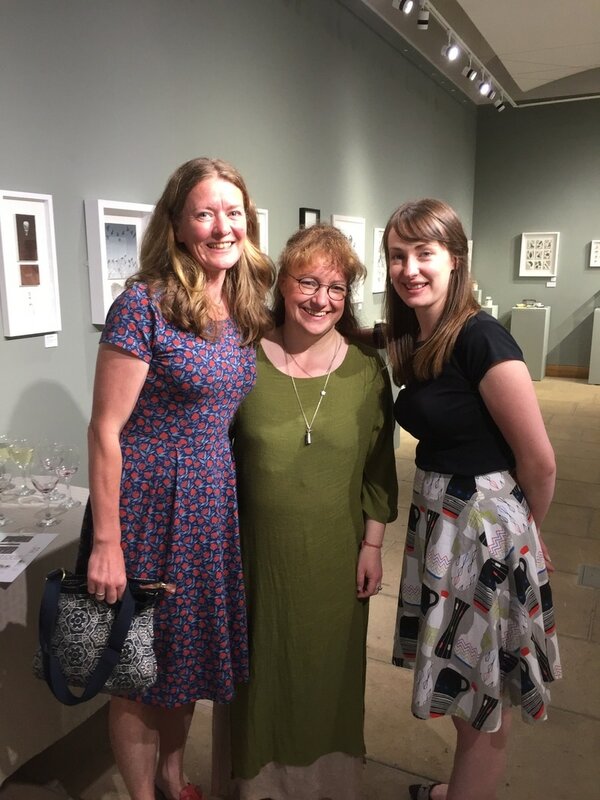 I continue to work with Hester Cox and Charlotte Morrison on the collections project and am looking forward to exhibiting with 3 Peaks arts in the autumn. 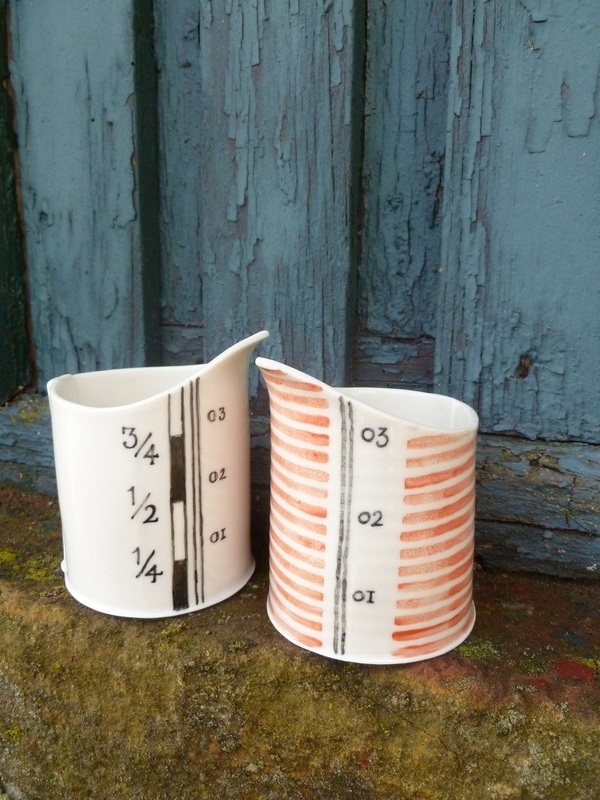 North Yorkshire Open Studios is on 3/4 and 10/11 June. We are open at Artison, High Burton, Masham. Please do come along and join myself Ian Scott Massie and Charlotte Morrison - we also have CAKE! 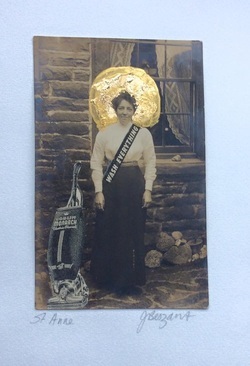 This month (27th) sees our new exhibition of Collections launch at Ryedale Folk Museum. We have been priviledged to be able to go behind the scenes here into the hidden archives. We particularly took inspiration from the Elizabethan glass found around the secret glass kilns of Ryedale and a very decayed wallpaper collection from an ancient house in Billsdale. We have worked on collaborative pieces as well as our own new work and there will be small new works available from just £20. If you'd like to come and have a chat to us we will be there from 1pm - 3pm on Saturday 27th. Entry to the exhibition is free throughout the show, you pay to go into the museum but it is well worth it! News has been sadly neglected - I seem to have been busier than ever. Last month saw the launch of the 1st "Collections" exhibition at Masham Gallery, all the work is on the website. We have dates for the next exhibition coming up Ryedale Museum 27th May - 16th July 2017. In 2018 in April and May we will be taking the exhibition to Sunnybank Mill, Farsley near Leeds. We will be joined at this show by: Jennie McCall, Kate Bowles, Sue Brown and Jane Bevan. You can keep up to date with this project on our website. It's the start of May as I sit here and write. I have mostly been squirrelled away in the studio making work for the collections exhibition in November/December this year. 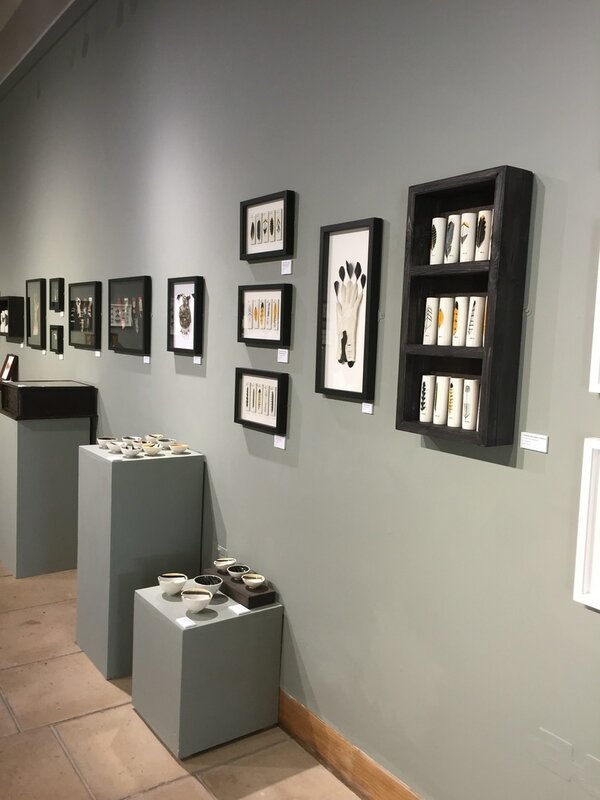 I am sharing the gallery space with printmaker Hester Cox and ceramicist Charlotte Morrison. We hope it is a group that will continue together and grow including other artists and other spaces to show. Please take a look at the seed of the website here. 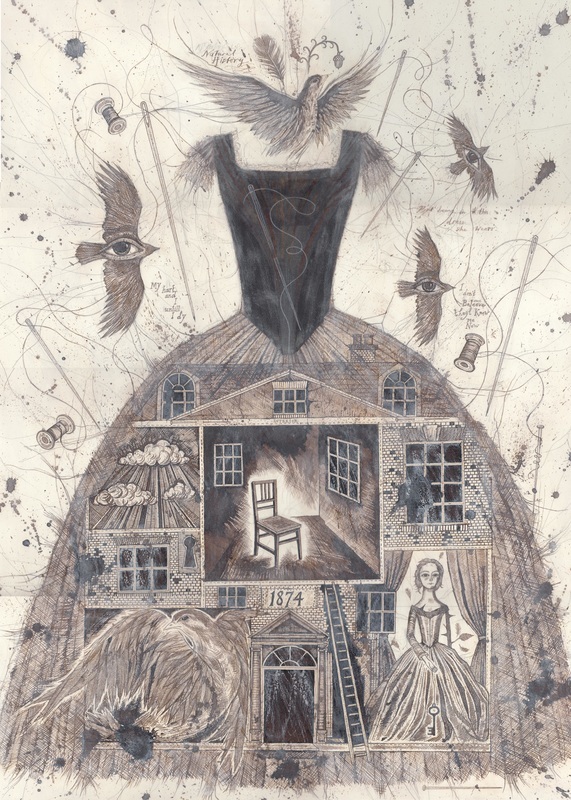 From the 27th of this month I am showing at FAB the fringe festival in Bath with some of the work from the Tales of History And Heronines show. I am also preparing a small exhibition to take to Portsmouth in June where I'll be speaking at a conference run by the University. 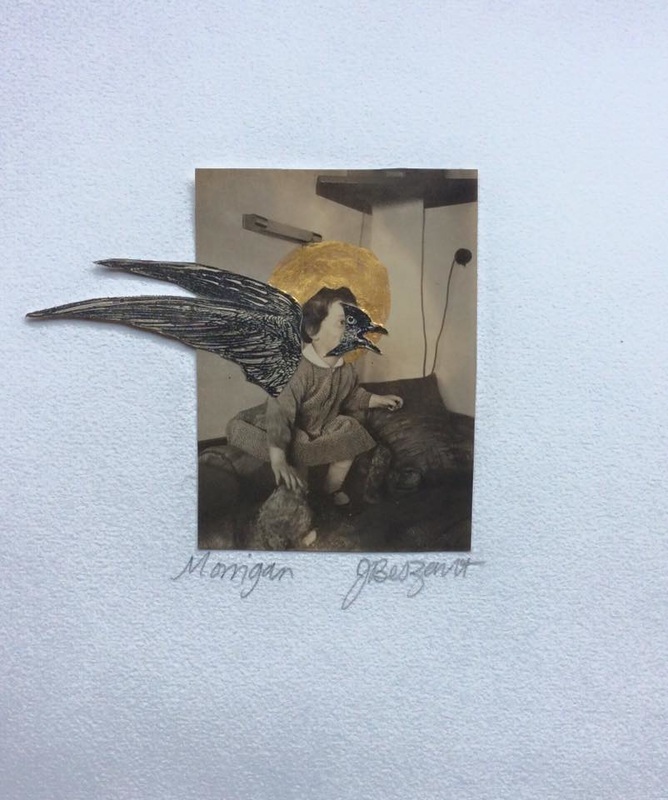 I've missed writing about the wonderful International Collage Exchange - you can see all of the work exhibition here. I'll try and keep a bit more up to date with my news in the coming months. 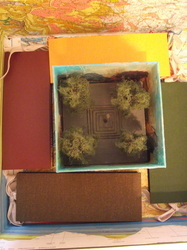 Below are a few little collages that went to New Zealand for the exhibition and exchange. This month I am loving the plentiful time I have in the studio and I have got really involved in my next major exhibition work based on collecting. I'm working with all sorts of materials including lots of gloves, silk cocoons and wishbones! I've also had the most wonderful visit to the studio from the sister of the first female train driver, Karen Harrison. I made 2 pieces for Karen which were part of the Tales Of History and Heroines exhibition, I was completely captivated by her story and strength of personality. Marie, Karen's sister, told me so much more about Karen and it was such a privilege to make the connection. 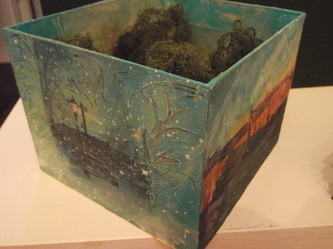 I am thrilled that the work I made for Karen went home with Marie to her family. It was a very special day. For the next few weeks I am off to India, a place I adore and medicine for the soul. And so the exhibition "Tales of History and Heroines" is upon me. The show runs at my own gallery in Masham, North Yorkshire from November 20th - December 31st. As I write the work from Sarah Morpeth and Victoria Brookland has just arrived and I find myself humbled to be exhibiting alongside them. Their works are really sensitive and very moving with a depth that goes far beyond the decorative. 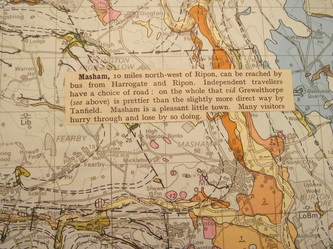 I'll post as much on line as I can on Masham Gallery pages. You can find the work I have made for the exhibition here, I have taken inspiration from women who have acheived a huge ammount against difficult odds and remain relatively unknown. Time has run away from me again - it's not that there has been no news in July and August- it's just that it's one of my busiest times at Masham Gallery and keeping up with everything can be a bit of a juggle at this time of year. Yesterday (2nd September) I gave a talk on my work at The Mercer Gallery in Harrogate where I have a piece hanging in their Open Exhibition. It was nice to be given a really warm welcome by a full house who showed genuine interest in the work. The standard of the exhibition was high and really well curated, it's on until November 8th if you can make it. 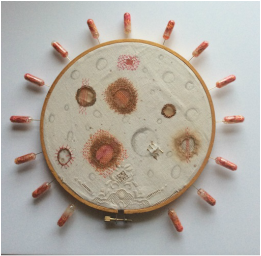 I was delighted to hear that I have a work selected for the Project After Birth exhibition which opens at The White Moose Gallery in Barnstaple Devon and looks to be touring after that. The project is a fascinating one, and close to my heart, I'm thrilled to be taking part. At the moment I am working on a few exhibition and competition pieces as well as the project for this November "Tales of History and Heroines". I am also excited to be starting work on an exhibition with Hester Cox and Charlotte Morrison in November 2016 to do with collections. Preparations are well underway for North Yorkshire Open Studios next month.114 artists are taking part and it's a good opportunity to tour studios and chat to artists/view/buy work. I have just finished a large commission that has consumed my time and attention for many weeks, a photo is below but you can see more here. I am now deep in to the work for the exhibition at the end of the year and finding the research and construction fascinating. Some pieces are sculptural and some bear more ressemblance to collections but all are portraits of particular women who history may not have remembered. If you would like to see the book 'International Assemblage' that my work was included in last year it is available to view/buy from here. Work has been slow in the studio as the cold seeps in to bones and brain, but here are 10 small collages off to New Zealand for the International Collage Exchange, exhibition and who knows what else. They are based on my great uncles disappearance at the end of the 2nd world war. He was a reconaissance photographer. The good news is that I've been selected for North Yorkshire Open Studios again this year (June 6/7 13/14) and will be looking forward to sharing the space at Artison with Charlotte Morrison and Ian Scott Massie. No Rosie Scott-Massie this year as her baby is due just a couple of weeks before. 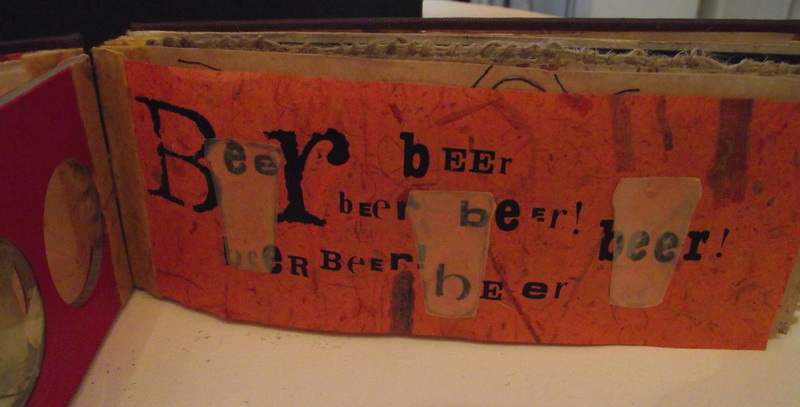 In other exciting news, last year I was invited to be part of a book about assemblage artists across the world. As I write it is being published and the exhibition is online curated by the very wonderful Dale Copeland. It's a great honour to be in the company of 26 artists from 7 countries whose work I admire immensely. I have been spending the last week engrossed in research for an exciting exhibition at the end of the year entitled "tales of history and heroines". 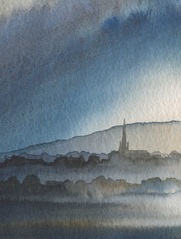 I'll be exhibiting in Masham with Victoria Brookland and Sarah Morpeth. 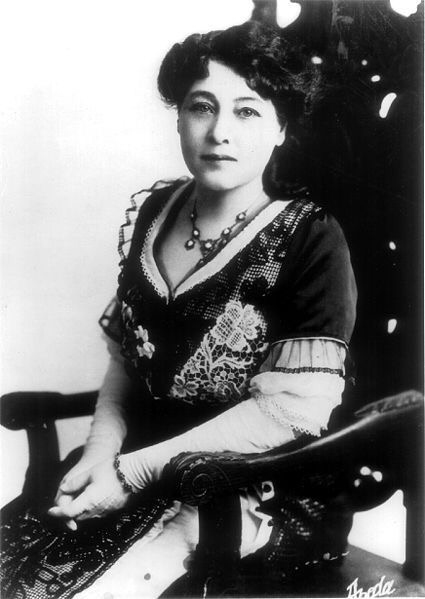 The reading and planning of work has been fascinating and all consuming and I have come across some amazing stories of women I was unfamiliar with. 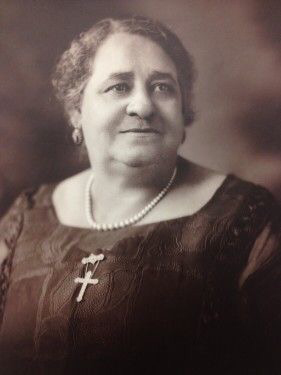 People such as Maggie Walker the first female owner of a bank (1867- 1934) or Karen Harrison the first female to drive a train in the UK as late as 1978. In the 21 years I've run Masham Gallery I have rarely taken a place in an exhibition here - it'll be great to be showing work alongside artists I admire. 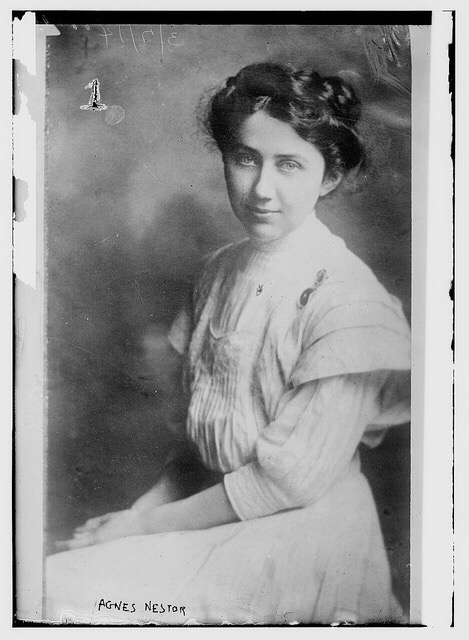 Agnes Nestor - women's trade union league, international glove workers union. I've been invited by artist/bookmaker Kate Bowles to participate in a blog hop that links a whole plethora of artists and makers across the globe. It's an honour as I admire her work so much and she's a lovely person too. 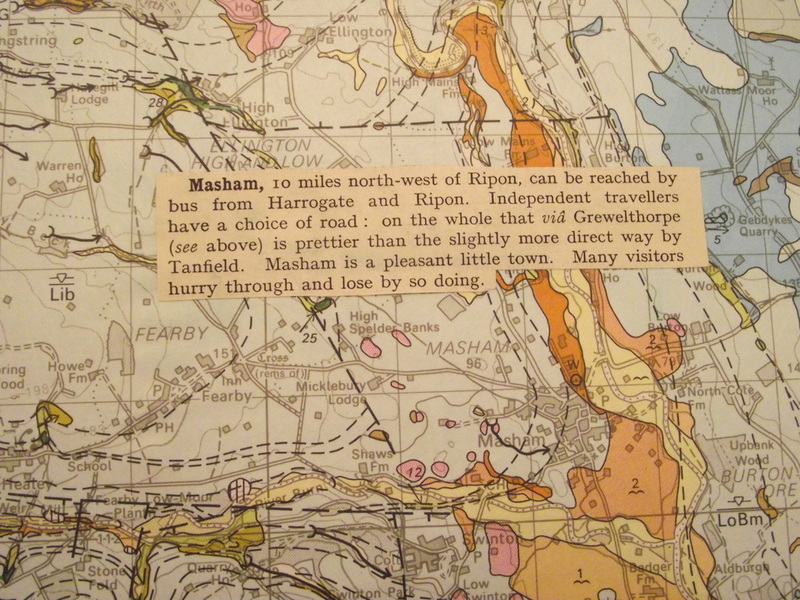 A few years ago we worked together on a one off project (the Masham box- right at the bottom of this page). 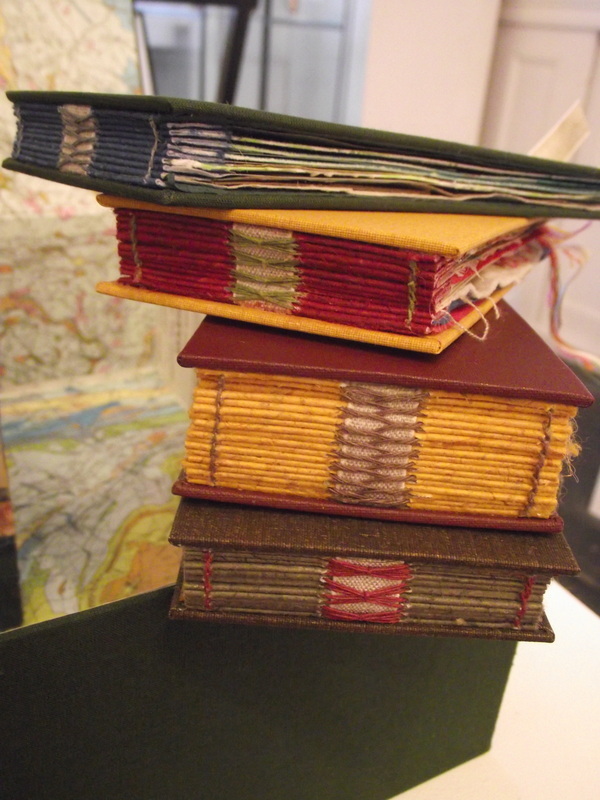 Her books are exquisite and it makes me want to fill each one with very special things. At the moment my main project is working on a Russian folk tale called Vasalisa the brave/beautiful. I've been working on this on and off for over a year now. 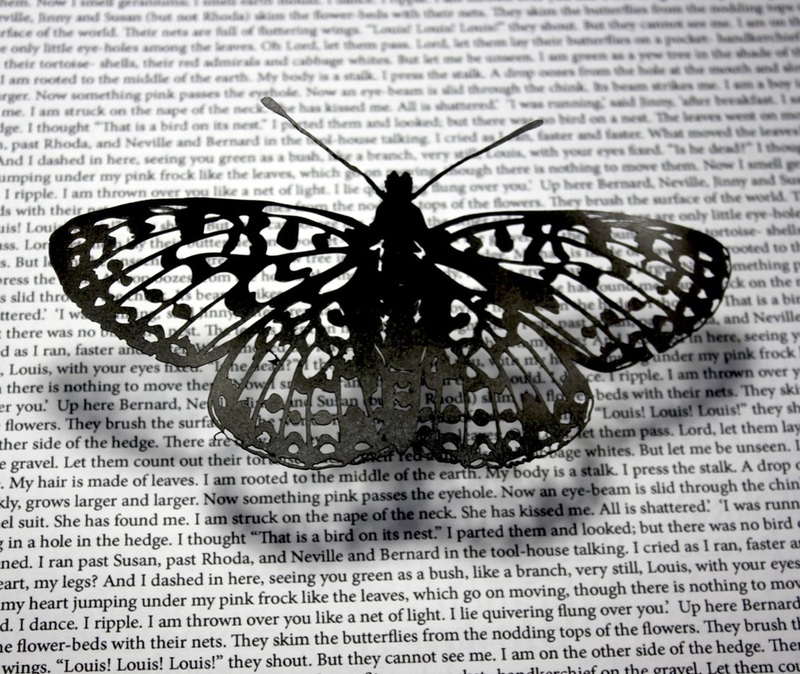 I hope to produce a series of sculptures that will crystalise the essence of the story for me. I love the layers of meaning in the story and the idea of an object as sacred. This is a very difficult question to answer. Most of the time I'm not even sure what genre my work falls into. 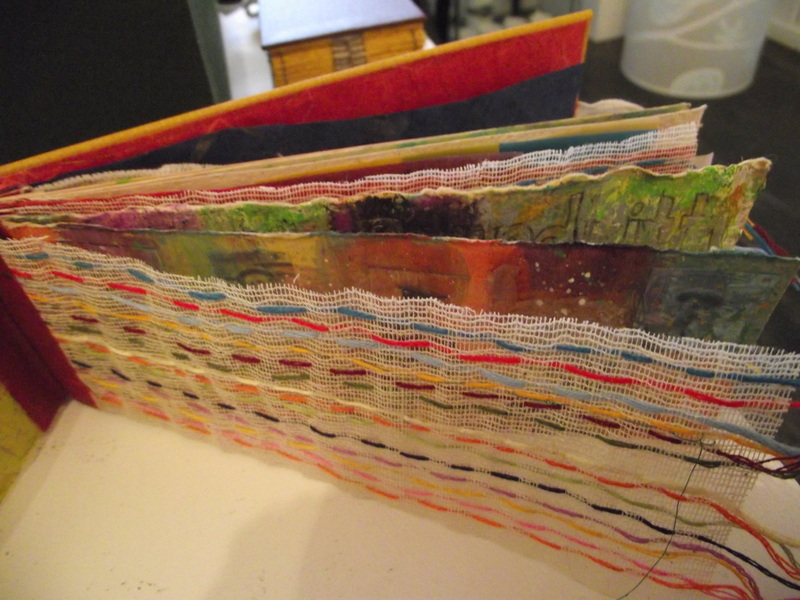 It's collage, sometimes sculptural, sometimes involves textiles, often assemblage...so is it found art? Not really as I modify found objects so much. There are artists who have elements of work that are similar to mine - I can think of Alice Fox, Dale Copeland even Lisa Kokin. But I think our motivation and what we are saying through our work can be quite different. I've tried not doing it, I think I go a little crazy. It feels like it's not a choice really. So in some ways it's purely selfish. However I do believe art (whether that's film, paint, music or storytelling) has the power to move people, to connect us on a very deep level. That has to be good. It feels like a good thing to be doing. There's so much pain and hurt in the world if we can connect with another it has to be worth it. 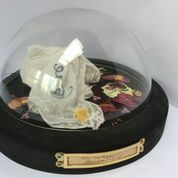 My work is very much involved with the beauty that can be found in the broken and the damaged, in the stories that we carry through the objects that we preserve. When someone recognises something in a work I've done, when they understand something about themselves or someone else it's a moment like nothing else. In so many ways! I have a (very large) collection of objects, ephemera, some would say junk. Often these will be the jumping off point for a story that will lead to a finished work. I love metaphor and layers of meaning, I will note these links down in a sketch book. I do sketch but not in a neat and pretty way - there are lots of notes, colour tests, arrows - scrawls really. I might be working on a few ideas at once, sometimes they form quickly sometimes it can take months. 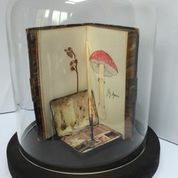 If i think a particular process or skill is need to make a peice work I will often go and learn that until i am happy I am proficient in the area, sometimes i will colaborate with someone else to make an element of a final work, for instance Dave Wardman makes my glass houses that I put work in. Although I have gained the skill to make them Dave is SO much better than me! My studio is scruffy to say the least, but i've tried to work in a tidy ordered space and found it impossible, that enviroment in itself is part of the process and the space is sacred to me. 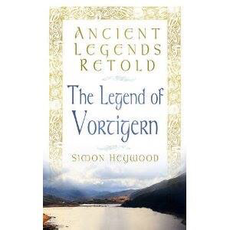 Simon Heywood. How to describe Simon? A captivating storyteller, a folklorist, an academic, a writer, a peace activist, a friend. Someone I very much admire for not being afraid to use his voice. 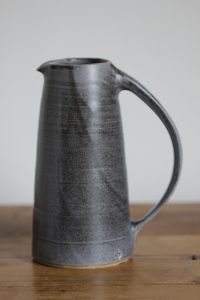 David Worsley (Dove Street Pottery). David is fairly new to ceramics compared to many of the seasoned artists and makers I know through Masham Gallery. His work has something that I very much aspire to, a strength and simplicity of form and colour. Thanks for visiting and hope you enjoy the next blogs! Well time has really flown since I last updated my news! 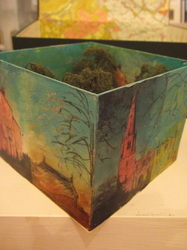 This summer has been very busy with my work in Masham Gallery. We have had the Tour de France pass through Masham and lots of people with it. Time in the studio has been limited. With the time I have had I have been working on a story - specifically the story of Vasalisa the brave, a Russian folktale. Words are perhaps not my strength the story is told much more eloquently here if you want to read it. 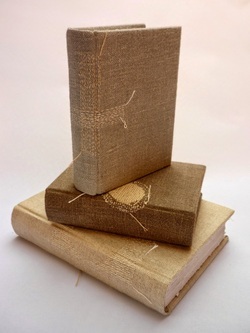 In the meantime I am making a sculpture based upon it and an illustrated handbound book. Hopefully to be finished soon, it has been many months in the making. long time no news. Well more accurately I have been buried in adventures and new work. For the last couple of months I have been working on "The Cold Bath Road Mystery". Commissioned by Chrysalis Arts Development and part of the Yorkshire festival of culture it will be spanning North Yorkshire Open Studios and the Tour de Yorkshire. 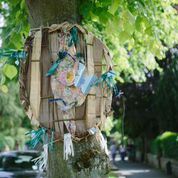 It's designed for a family audience, the event combines performance and puppetry with a gentle stroll up Cold Bath Road, one of Harrogate’s most attractive streets, where a series of artists’ installations are to be found in the form of a trail, which helps reveal the mystery. 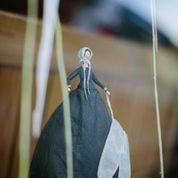 It has been really exciting working with storyteller Matthew Bellwood and puppeteer Vivien Mousdell developing this into something really extraordinary! 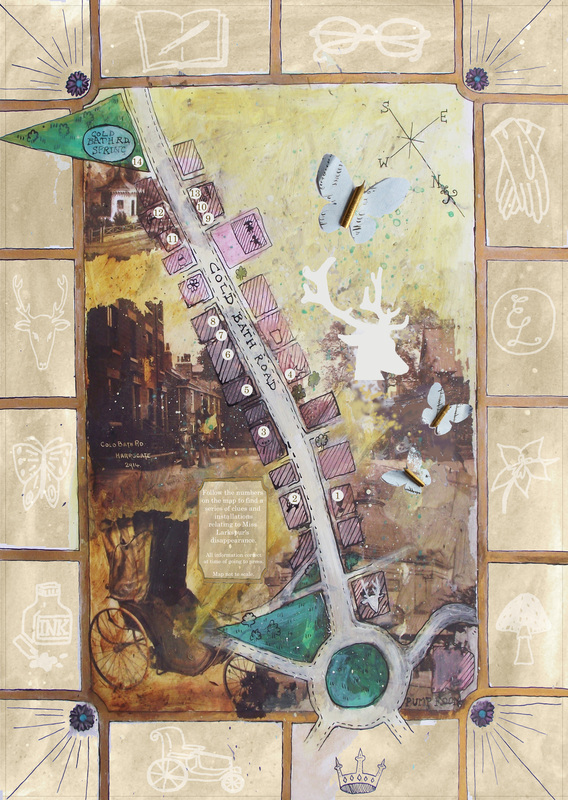 map of the Cold Bath Road Mystery - part of the leaflet trail. 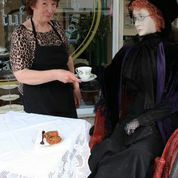 life size puppet of Miss Emmeline Larkspur created by Vivien Mousdell. 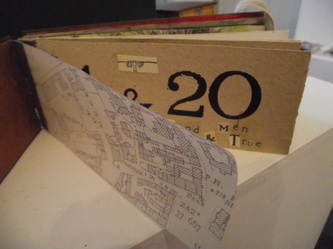 Part of my work is to design the leaflet and the map for visitors to follow (see above). 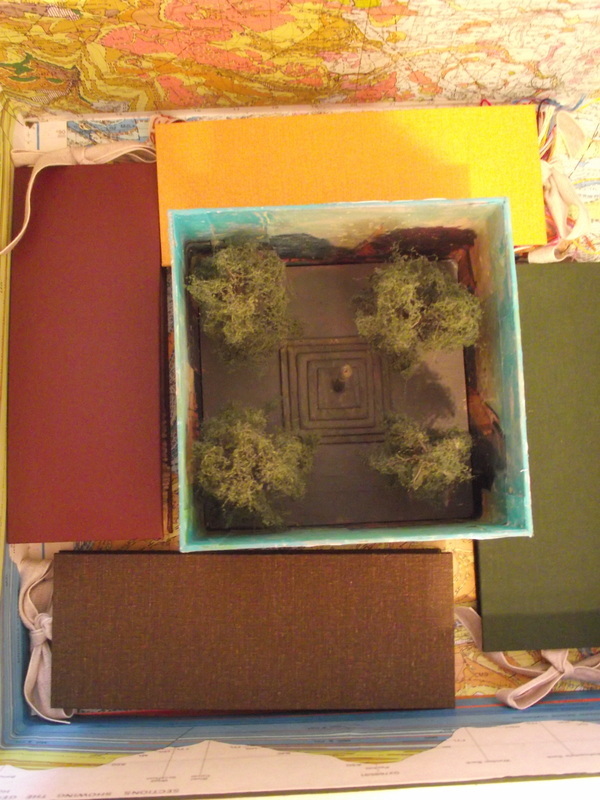 The next part that I'm working on now is to create 3 large sculptures/installations around the story and another 6 smaller museum style boxes to contain "evidence" from the story. More images of that stage coming soon. an event where you can find fresh, contemporary, quirky art, craft and design that's being chosen for its quality & originality. No made-it-from-a-craft-kit assembly jobs, no peach coloured crocheted toilet roll holders. I will be opening my studio along with Rosie Scott Massie, Ian Scott Massie and Charlotte Morrison. Please do come along! 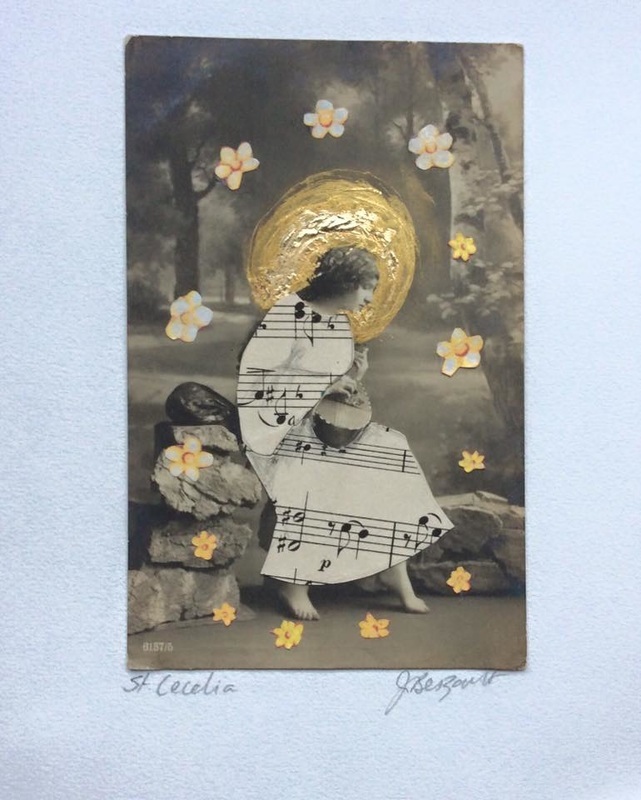 This month I have been working on a few new pieces, both collages and 3d shrines. I've put my entry into the Royal Academy Summer show (fingers crossed!). 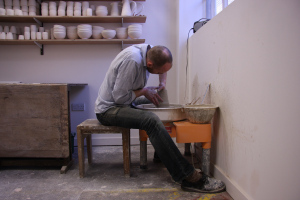 I've also been filming with Masham Gallery, this time making a film about ceramicist Charlotte Morrison. Next month I have 5 pieces in the fabulous Artlink in Hull. 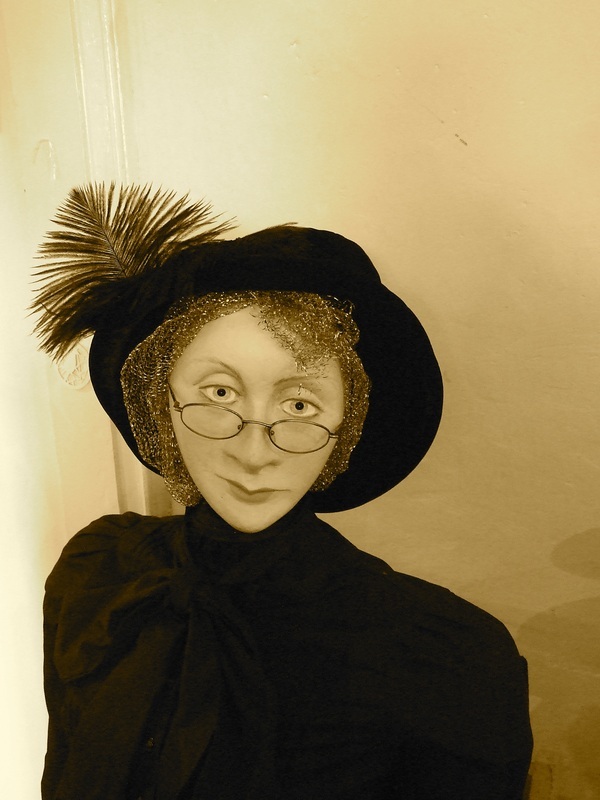 They are running an intriguing exhibition called "the curiosity shop". Please do call by if you are in the area, its there from 8th February - March 14th. Next month I am travelling to the wonderful Rajasthan where I'm sure I'll find tons of artistic inspiration! Detail of Account no 1 on show at Artlink, Hull. Well life has been so busy I have let my news slide - sorry! I have just finished teaching my last workshop for the year and have had a wonderfully hectic few months! to summarise briefly: September saw the Treasured Fragments show in Southwell Minster. I was really delighted with it there were so many visitors and some wonderful debate and comments in the visitors book. October was the Masham Arts Festival which I have been very much involved in organising for the last 10 years. It was vibrant and fun, eccentric and exhausting all in 10 days! Alongside the Arts Festival was the Crafted By Hand event which saw over 1000 people through Masham Town Hall to watch, take part in craft skills and buy from some of the most talented contemporary makers. Charlotte Morrison and I organise this - see more about it HERE. In the beginning of November I went to the 2nd year of my Walking the Wildwoods course with Shonaleigh Cumbers. Now that was a magic week! I was delighted to receive this review of my work recently too, thanks very much to James Holden, also to be featured HERE on the Art Connections site as well as waving goodbye to some of my favourite work to new homes. PHEW - now I am taking a breather - I am catching up on exhibitions and competitions to come and hopefully grabbing some time in the studio. Well this month is simply frantic! 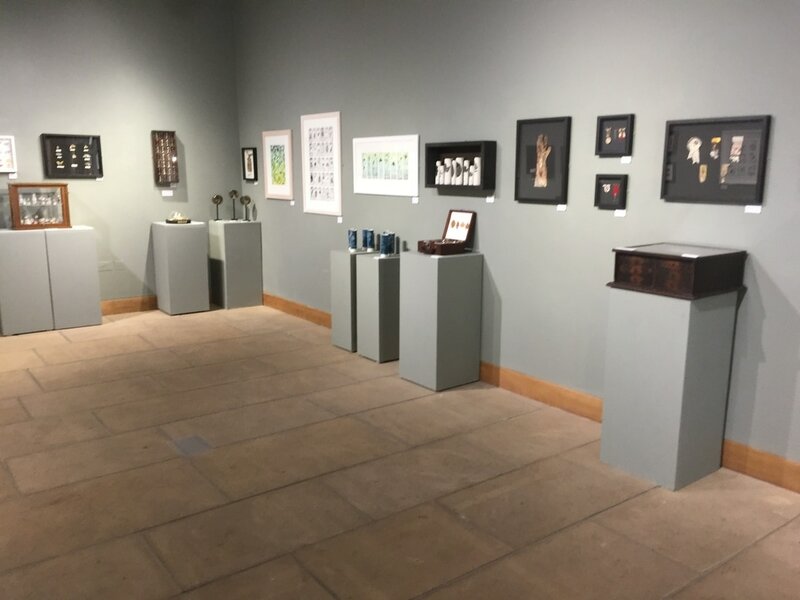 As well as managing Masham Gallery there are catalogues, posters, postcards, press articles, banners, signs, labels to do and all those other little things that go into making a solo exhibition come together. Invites are in the post as I write - please contact me if you'd like one and you're not on my mailing list. I have had tremendous support from lots of lovely people with everything from loaning me storage to proofreading. 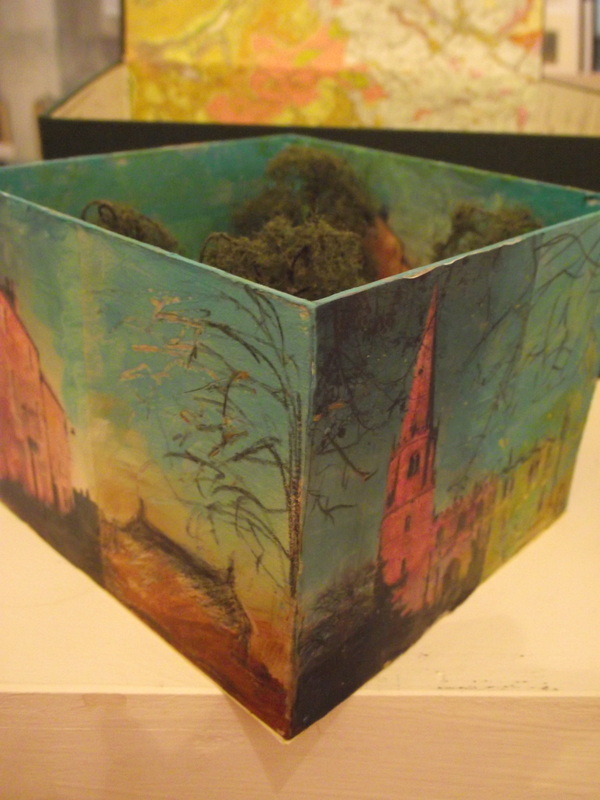 All the work is there ready to go and I can't wait to see it in the gorgeous surrounding of Southwell Minster! Hope to see you there. This month and next I have 5 pieces in the lovely Cupola Gallery in Sheffield. 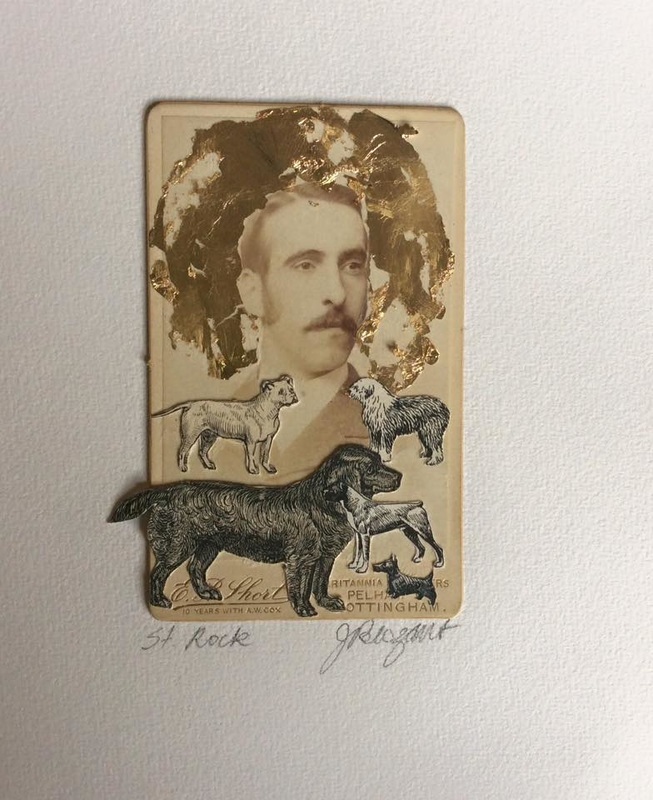 Their exhibition Kilter Kelter is an intriguing one; “Kelter” is local Yorkshire slang for ‘rubbish’ and when something is ‘off kilter’ it is out of alignment, so this exhibition and the title refers to the idea of bringing what used to be considered ‘rubbish’ to new life. The exhibition starts on July 26th and continues until 8th September and is working with the Spaza Gallery in Johannesburg to create a twin exhibition. Cupola will set up a large screen and live web link so artists can share ideas and talk to each other across continents. Some of the smaller African Art works will also be available to order via Cupola. 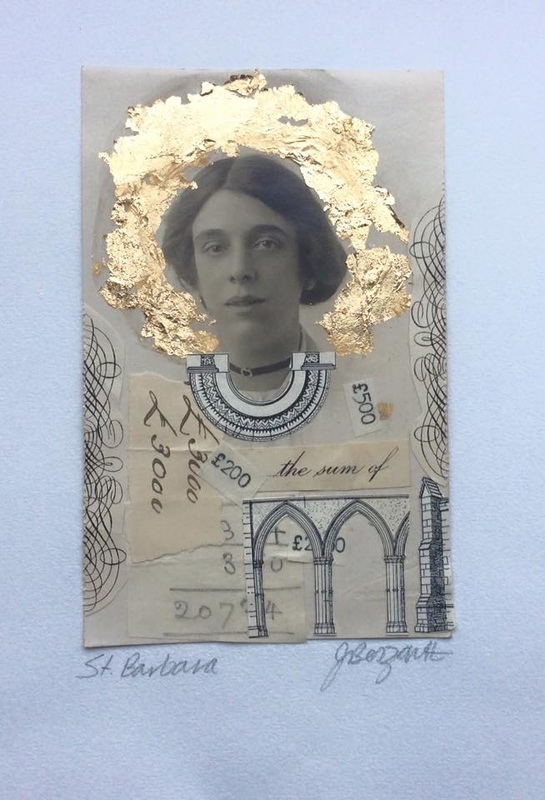 If you are in the vicinity of Southwell, Nottinghamshire on Friday 21st/22nd you have a chance to participate in the Treasured Fragments exhibition I am having there in September. These treasures will be displayed with their stories in glass cases leading to the Chapter House for the duration of the exhibition. "Do you have any small items that maybe are of no value to anyone but you because you know their story? Would you be willing to come and talk to Josie about their meaning to you and lend them for this exhibition? These could be an old photo, piece of jewellery, something that belonged to someone else, a souvenier or any object that holds a meaning or story for you that you would be willing to share. Josie will be here and waiting to meet you on Friday, 21st June from 12.45 - following the Friday Lunchtime session and again on Saturday, 22nd June from 9.30 to 11.30am. Please come and take part! For further information contact Caroline Jarvis in the Minster Office - 01636 817285." This month is the very wonderful North Yorkshire Open studios. I have a studio space open at Artison on Saturday 8th/15th and Sunday 9th/16th, 10.30am - 5.30pm. I will be sharing the space with 3 other rather fabulous artists (although I may be a little biased!) so alongside my (very) new work will be that of Rosie Scott Massie, Charlotte Morrison and Ian Scott Massie. It's a chance to see how we work, what inspires us and have a chat, a cuppa and perhaps even a piece of cake! Artison is a great place to look around too with its lovely warm atmosphere and huge range of workshops that take place there it's a fascinating environment. 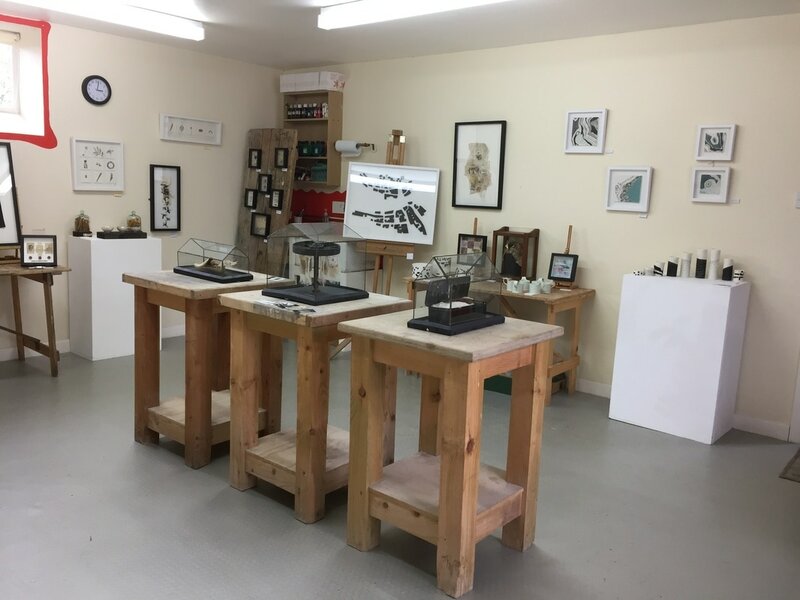 If you are making it to Masham over Open Studios weekend please do drop in and see Hester Cox at her printmaking studio too. You can find details HERE. 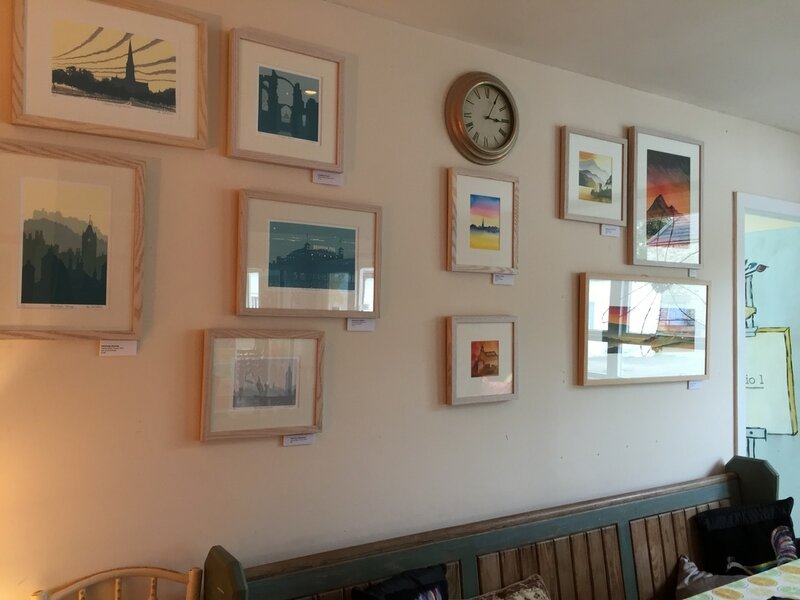 Anna Poulton and Stuart Whitehead are very close by too and part of over 100 North Yorkshire artists taking part this year. To see the whole list go to www.nyos.org.uk. 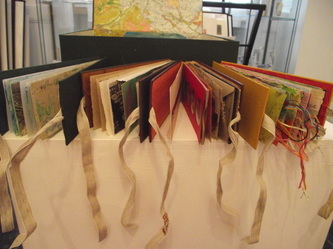 While you are in Masham the amazing "Paperworks" exhibition is taking place at Masham Gallery - really not to be missed. To complete the creative weekend don't miss the other galleries in Masham - Nolon Stacey, Nikky Corker and The Blue Light Gallery. Hope to see you soon. Well I didn't win that wonderful Adrian Henri Prize but I was up against some amazing competition. The winner was a stunning glass sculpture from Linda Norris. I have to say I loved the piece and it was well deserved. Until this month I had never been to Much Wenlock and it was a really wonderful surprise, lovely gallery and independent shops and a stunning setting, I'd really recommend it. The rest of the month's artistic time has been taken up with teaching (I love teaching Art for the Terrified at Artison!) and completing a very unusual textile commission, which I may share at a later date. 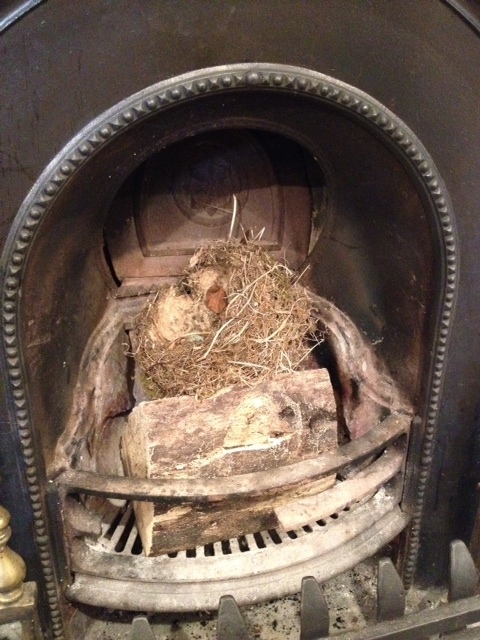 This has completely diverted me from the job in hand - working towards the Treasured Fragments exhibition at Southwell. However sometimes I find this is a good thing and I will come back with fresh eyes and energy. Over the last few weeks I've been squirrelled away in the studio working away at lots of ideas that have been bubbling through my mind for some time. Gradually work is coming together, always more slowly than I imagine. I've also been starting teaching again and had a great visit to Scalby in Scarborough and an "adventures in paper making" workshop at Artison. Yesterday I had the best news - a piece of work I have recently finished called "Thursday's Child" has been shortlisted for the Adrian Henri Prize. The prize is judged by, amongst others, the Poet Laureate Carol Ann Duffy, and I am a little starstruck! Now I'm busy finding a courier to get it to the very gorgeous twenty twenty gallery in Much Wenlock and keeping my fingers well and truly crossed until April 6th! I have finally got around to creating a facebook page for my artwork. If you would like to meet me there I'd be delighted. I've been spending lots of time in the studio and have updated the 3D page with some of the latest results. I am sewing a lot of paper collages at the moment which is time consuming but immensely satisfying. 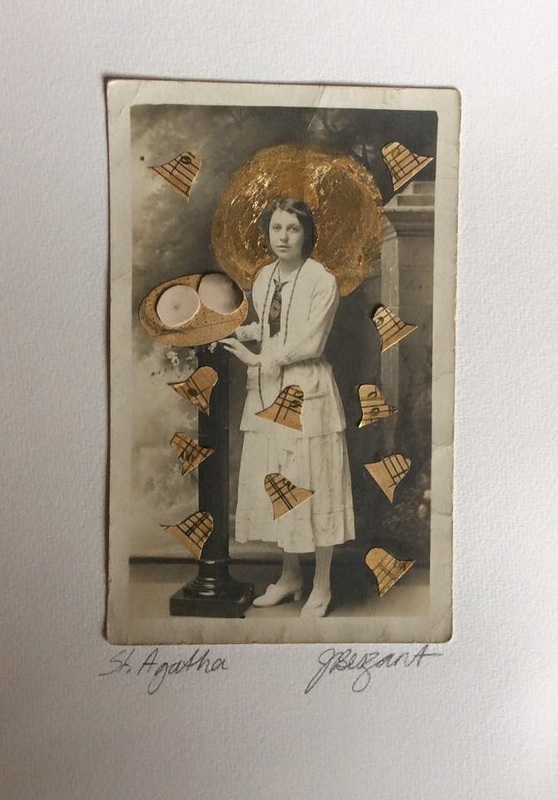 As well as creating work inspired by reliquaries I am loving being inspired by some of my favourite poems for entering some work into the Adrian Henri prize. Orchards and dark-green fields; on--on--and out of sight. This month I have just embarked upon a course run by the amazing storyteller Shonaleigh Cumbers. 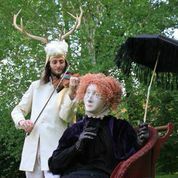 It is called "Walking the Wild Woods" and is designed to help you understand how stories are structured and created and to be able to structure the creative process. It is one of those times where I feel really privileged to be learning from such an amazing teacher. 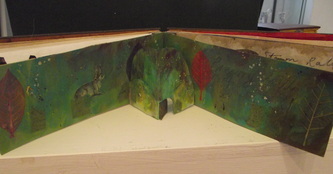 My artwork is mostly built on stories and this adds another dimension to the telling of a tale . The course takes place this year at Halsway Manor a stunning location in the Quantock hills near Taunton. Below are a few photos from a walk on an impressive ancient drove road above Halsway Manor. This month in the studio I have been focussing on sculpture. It has been a while since I've spent concentrated periods of time on 3D work and I'm loving the challenges involved. The majority of my work is very small and it has been interesting to break out of this as well. This month I am exhibiting in Colorado...and Harrogate! 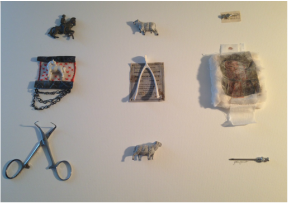 The Collage Centennial exhibition is in Pagosa Springs, you can see more details by clicking on the link. Much closer to home I have also been selected for the Harrogate Open where I will be showing one sculpture and one collage. The exhibition is from September 16th - January 20th 2013 at the Mercer Gallery. If you are in either location please do pay a visit, both exhibitions are free. 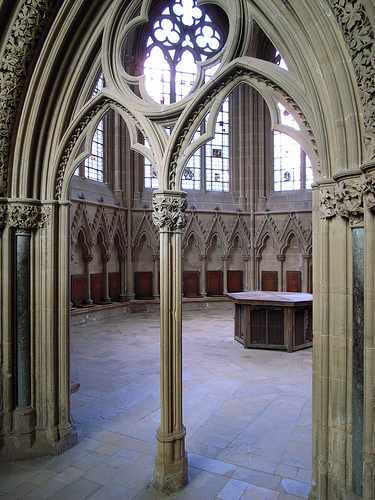 I've had great news this month - I have a solo exhibition to prepare for located in the chapter house of Southwell Minster in Nottinghamshire. 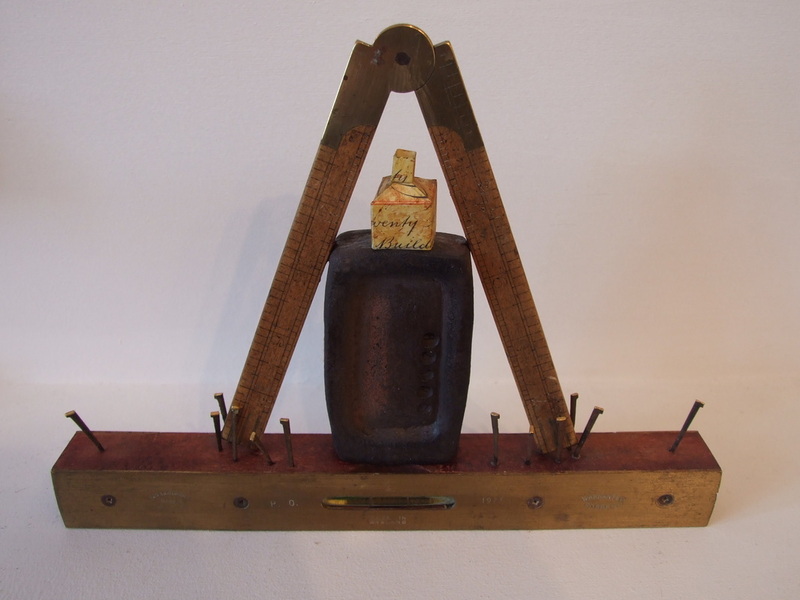 The exhibition is called 'Treasured Fragments' and will be mainly 3D objects based on the concept of reliquaries. Reliquaries traditionally held objects from saints such as bones or body pieces. Today in secular society we keep our own relics, our children's teeth, our grandparents letters or other scraps of memories. Along with creating sculptural pieces I will be curating other people's treasured fragments, items of little financial value but of emotional weight. Members of the congregation and wider community will be encouraged to take part bringing in their relics. 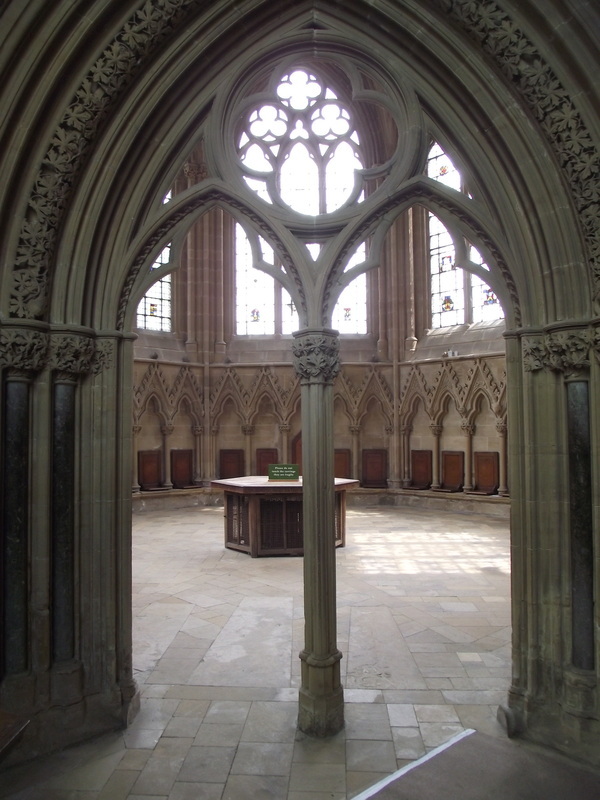 These will be shown, alongside their stories, in glass cases on the way to the chapter house. The exhibition isn't until September 2013 and alongside a few smaller projects this will keep me busy all year! As well as their own website the Minster has a facebook page. If you'd like an invitation to the exhibition or keep in touch with the vibrant cultural events programme in the Minster please contact them. 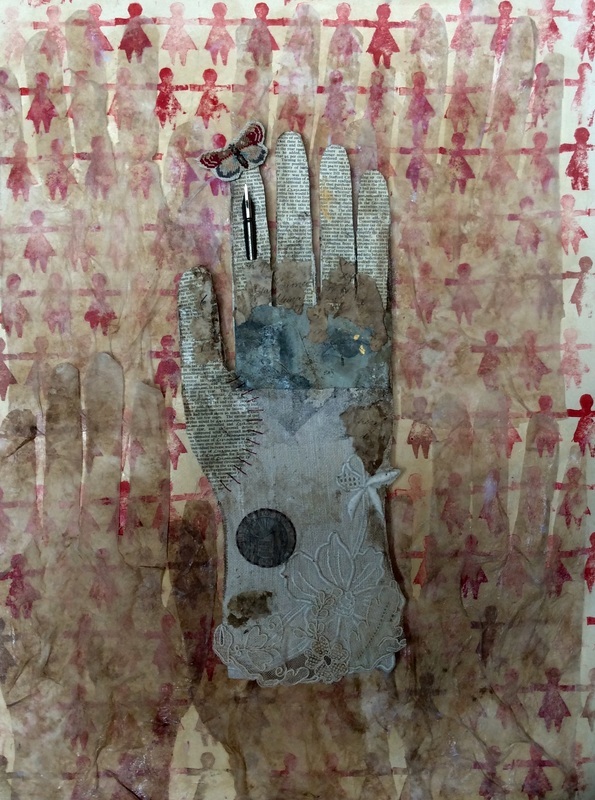 This month I have spent quite a few hours in the studio painting and exploring collage & textures on photographs. North Yorkshire Open Studios is underway with 100's of visitors visiting us up at Artison over the 9th/10th & 16th/17th of June. I've already met loads of interesting people and we've got through a ton of tea and cake! As well as lots of my work new and old I am working alongside ceramicist Charlotte Morrison, painter/screenprinter Ian Scott Massie and papercutter/linocutter Rosie Scott Massie. 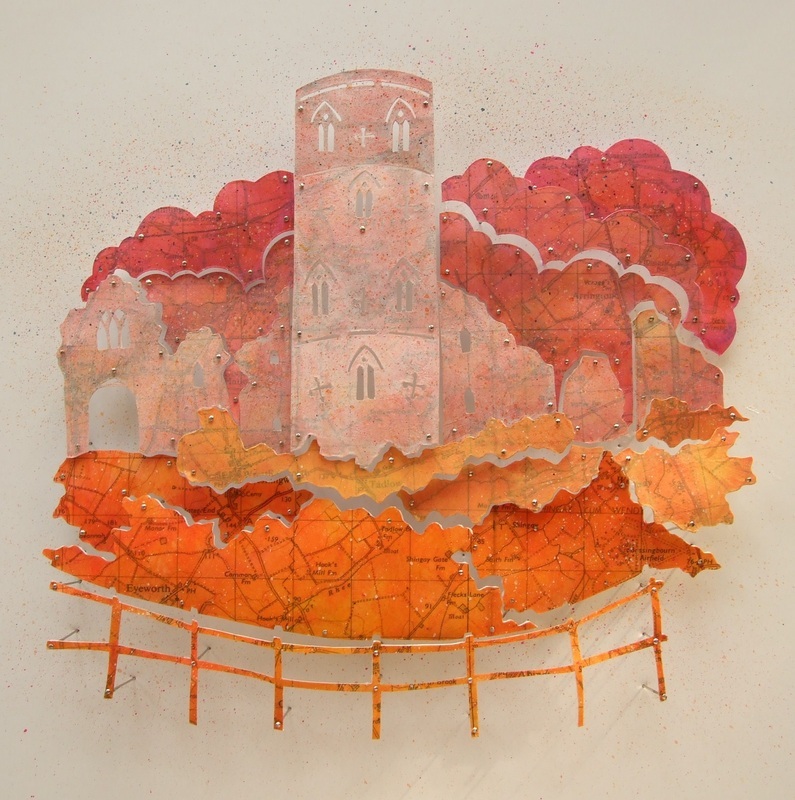 We are part of a trail of 130 artists - also including printmaker Hester Cox in Masham. 25th June - today Mel Kolstad has kindly featured me on her blog. Thanks Mel! 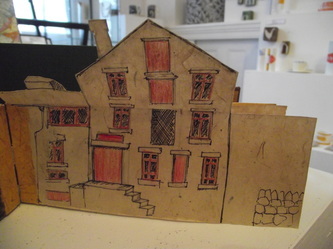 This month I am organising and taking part in "Close To Home" at The Gallery Masham. It is an exhibition that celebrates and supports the charity Herriot Hospice Homecare. Please come along to the exhibition if you can, it runs until the end of June 2012. My time in the studio this month is spent mostly preparing for North Yorkshire Open Studios - take a look at the website, it's a great event if you can make it. 4 of my 'medals' series have made it into the DJ touring gallery. Touring festivals in a retro caravan all the images are cd sized and displayed in the clear perspex boxes that they come in, a fab idea, keep up with their blog here. New work is in the Royal Hall exhibition in Harrogate which celebrates some of the artists taking part in North Yorkshire Open Studios this year. It's open from Thursday 31st May till June 17th entrance free, more details here. The International Collage exhibition is now up and open for sales online at http://tart.co.nz/exsales.htm or if you are in New Zealand at The Percy Thomson Gallery in Stratford. Please do have a look there are some wonderful pieces there. This month I also took part in this great exchange project - i can't wait for mine to come back through the post! 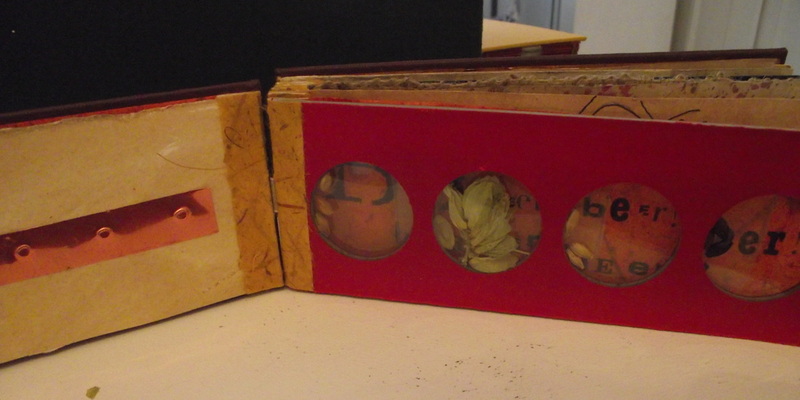 This year I'm taking part in the International Collage and Assemblage Centennial exhibition. 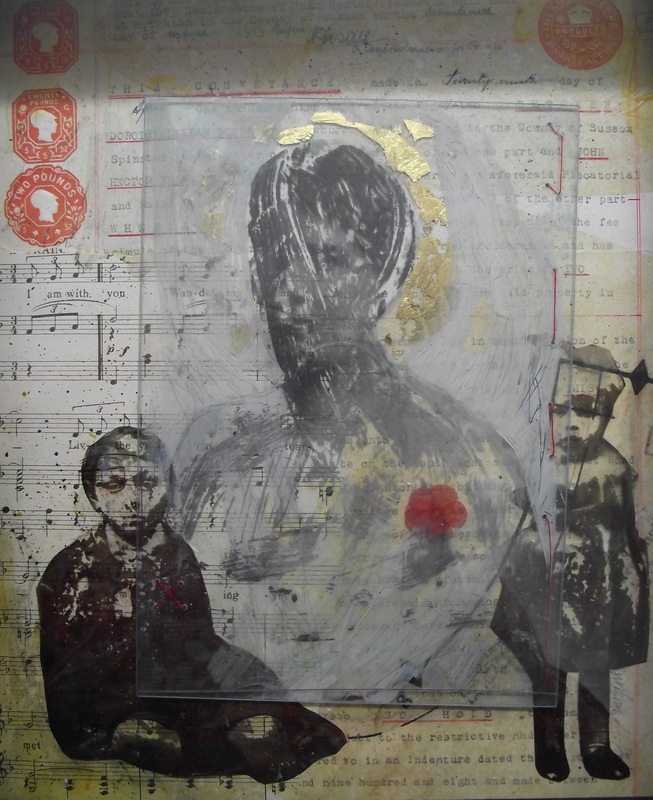 The piece "I Am With You" is currently winging it's way across the Atlantic to Pagosa Springs Colorado. You can see the developing show HERE. 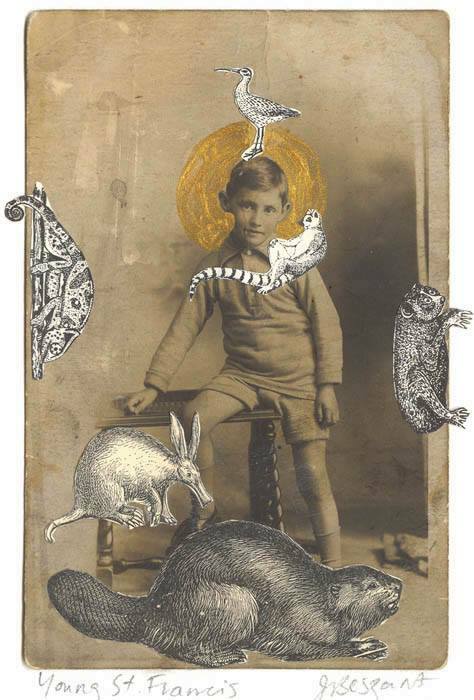 I've been working on collage pieces for the International Collage Exchange/Exhibition in New Zealand. If you want to have a look at last year's exhibition it's HERE. I've enjoyed the challenge of working flat and unusually I've worked almost completely in collage (I usually paint a lot on my work). Themes have emerged of reliquaries, ancestors and love. work is going on on "The Peculiar" walls have ears, books are growing out of the walls, strange and beautiful things are beginning to occur. Keep a look out for it finishing in 2012. Great news I am excited to be participating in North Yorkshire Open Studios again this year. Also showing in Masham are Hester Cox, Charlotte Morrison, Ian Scott Massie and Rosie Scott Massie. Dates are June 9th, 10th, 16th & 17th.